For a lover of words, choosing one word is a challenge. Well theoretically it is a challenge. But when the word chooses you, well that changes things. Switches it up a bit. If I recall correctly, which I am apt not to do, last year’s word, “Art”, chose me. Well loosely speaking. There is a mutuality to choosing a word. One feels drawn to the word. The word seems to fit and you and the word enter into some sort of agreement to co-exist for 365 days. There is some “self-identifying” that goes into it. For me, I think I will be called to “go” more. There is a mystery, a calling and a trust. Go and I. Locked arms for the year. Metaphorically speaking. As far as I know, “Go” has no limbs. Choosing “a word” for the year is being done by many bloggers and writers. The idea is catching on. As best I can tell. I only know that I kind of like the idea. It seems to give me a focal point. A way to focus my life, my writing. It grounds my writing in some way without being legalistic and boxed in. A gentle guide, perhaps. Providing a benchmark. A roadmap. A guidepost. (Alece Ronzino, @aleceronzino on twitter, and fellow-blogger at Grit and Glory dot com is the brainchild). I thought you should know. It is a bit counter-intuitive to sum up a year at the beginning of the year. But I like the concept and something, in retrospect, about last year’s word “Art’ did define my year in many ways. One Word 365 has an expansive website which I found interesting to explore. You may want to visit it too. And be inspired to identify your own word. So for now I am at peace with where I will go with “Go” in 2014. I feel the impetus of a verb behind me, propelling gently my writing life. Last year’s noun suited last year. And helped me focus on the art of living and creating. 2013 offered many opportunities and my writing got up and went places. Exciting places, far away places, intriguing places. So maybe “Go” makes sense and in fact is not as simple or odd as it may appear. 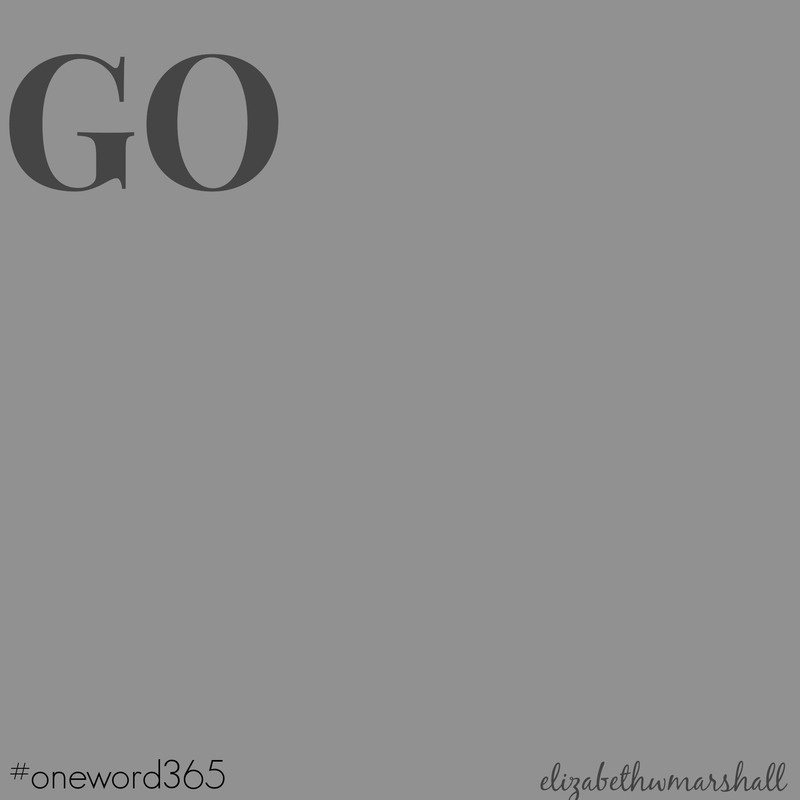 “Go” whispers the beginnings of “God”. It hints and reminds me of the Divine. Turns me and points me like a spiritual compass before I even actually move. And my #oneword365 is active and passive. I find peace in that too. I can intentionally begin my days with “Go”. Focused on movement of the heart or body. And though I may not leave to travel to far flung places, traveling only on the page with my writing, I am still active and moving. “Go” reminds me that I should stay less often. If you have read here for even a little while you may recall that I create wide margins, habitually, regularly, by design. I am comforted by wide margins. But I may need to say yes to going more often. Exploring. Seeking. Challenging myself. Meeting new people, places, and things in the going. My life feels pulled ever so gently into more “yeses” to going. To risking. To bravery and boldness in many aspects of my art and my just living. Thank you for going with me. For walking along here through my poetry and prose. For listening to my noticing, my pondering, and for simply reading my words. It is an honor to “go” through life with others in this community. To look for God and all his glory in the cracks and crevices, the folds of the day, the nuances of life and in the everyday daily. Together. I am dreaming of going a few very special places this year. Lean in close and I will share one dream….that of joining a meet-up in New York in April with my friends at Tweetspeak Poetry. And I am anticipating some surprises along the way. There are always plenty of them, aren’t there. But mostly I am at peace just getting going daily. Loving well. Living well. Writing. Always writing. There is a book or two inside me that is just asking to be written. I hope I show up at my desk and actually go about writing a book in 2014. To that end, I am beginning a workshop on Monday with Jane Friedman. I wanted to add like ten exclamation points to the end of that sentence, but I thought it would be well, over-kill. Nine maybe, not ten. You may notice things a little quieter here, or a little louder. I may be holed up in my Tweetspeak Poetry Workshop, busily trying to improve my art. Or I may be running back here to share with you. Either way, I hope to be challenged and changed. Happy 2014 friends. I may not thank you enough. But I am grateful to have you here. You may consider joining me on instagram, twitter @graceappears or “like” my facebook page. All that would be lovely if you’d like to come “go” with me there. I love your word go! It has such possibilities. My word is Begin and I am still processing what that will mean in 2014. I have a lot of thoughts I want to share about my word, but have been sick this week, so thought I’d wait until I am more clear headed to delve into the choice. I did introduce it ever so subtly on my blog on New Years Day. I didn’t think I was going to do a word this year, but just like that, begin became my word. I think it works best when the word finds you. I look forward to seeing where you go this year! Open your heart a little bit and it takes you amazing places. GO, Elizabeth!